There are quite a number scarf patterns available on Ravelry, that use wedges of short rows. However, I was too lazy to search through them - so I just started knitting. Here's what I came up with - an easy scarf pattern. I used one skein (200 grams) of (probably) super bulky yarn and 8mm needles. You have now completed the first wedge. 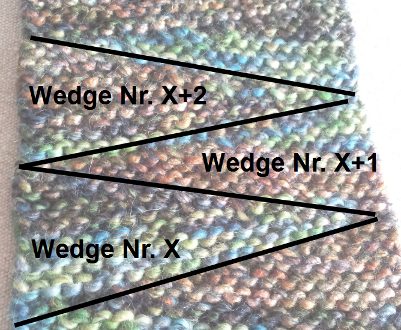 The picture shows how the wedges add up to a scarf. Since one wedge consists of 13 rows (i.e. an odd number of rows), each wedge starts at the opposite edge of the previous one. Repeat rows 2 to 14 until you reach the desired length. Bind off in the row 14 of last wedge picking up the wrapped stitches. 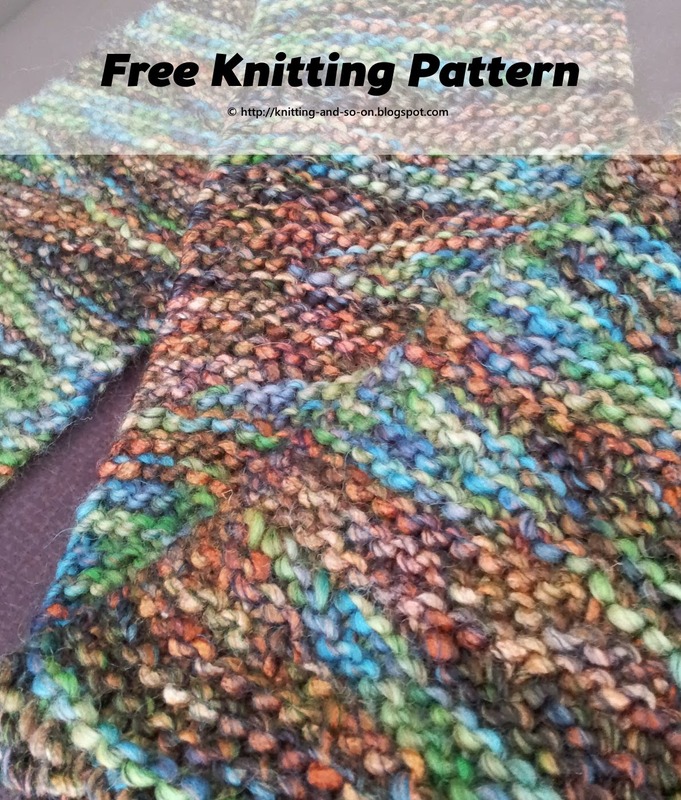 This pattern is listed on allfreeknitting.com as Unicorn Horn Scarf. I love this pattern but don't understand what w+t means. The photo info doesn't help me because I still do not understand that terminology. I think something got lost in translation? Can you help me, please?? 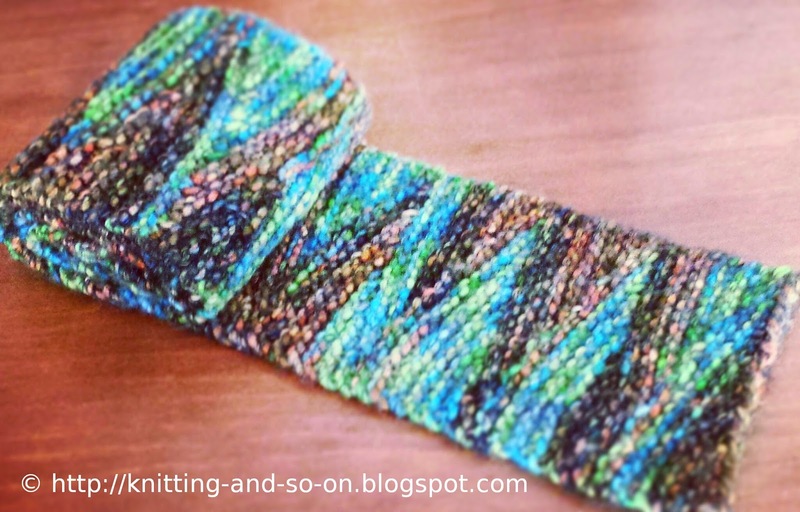 w+t is short for "wrap and turn"
Thanks for this pattern! Does the w+t is the same as the t+p? 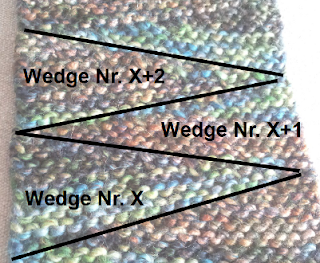 They are both ways of doing short rows: w+t (wrap and turn) is one way of connecting the stitches at the gap (see http://www.youtube.com/watch?v=G4GxFvi4KD0) and t+p (my abbreviation of turn and pull) another - called German short rows (shown here https://www.youtube.com/watch?v=P6n561SMZXQ). Both methods produce a similar result - it's just a question of which method you prefer. Just make sure that the stitch that is wrapped is the same that's being pulled back (i.e. creating the double stitch). Thank you so much!!! It makes perfect sense now that you told me! Thanks. I see it now. I wasn't looking for it there.